SEONGNAM CITY, South Korea (CelebrityAccess) – The day after 16 people were killed and 11 seriously injured, in a fall after a ventilation grate collapsed under concert-goers at an outdoor event in Seongnam City, south of Seoul, a South Korean official, surnamed Oh, committed suicide after being questioned about the incident on Friday night. Oh had helped organize and secure the outdoor concert. "The show host repeatedly told the spectators to come off the grate, but no one paid heed," one witness told the paper. The 37 year olds body was found near a 10-storey building in Seongnam on Saturday. It was believed that Oh leapt from the building after being questioned on Friday night, police inspector Park Jeongju said. Oh worked for one of the concert's sponsors and handled safety measures, officials said. "I am sorry for the dead victims… please take a good care of my children," he wrote in a short message to his wife, officials said. According to Seongnam City Fire Department officials, the grate collapsed during a K-pop concert featuring a number of groups, including girl group 4Minute. 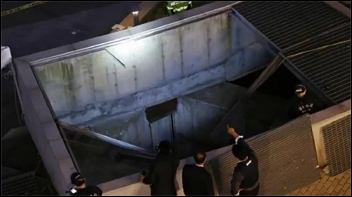 Police said the victims were standing on top of the large grate and 27 people fell more than 20 meters into a vent shaft after it gave way. According to the Korea Herald, approximately 1,000 people were in attendance at the concert, with witnesses reporting that most of the victims were office workers in their 30s and 40s. The concert took place in the Pangyo Techno Valley industrial complex, which is a tech center in South Korea. Another eyewitness told YTN news: "There was a sudden, loud screaming, and when I turned it looked as if people were being sucked down into a hole."